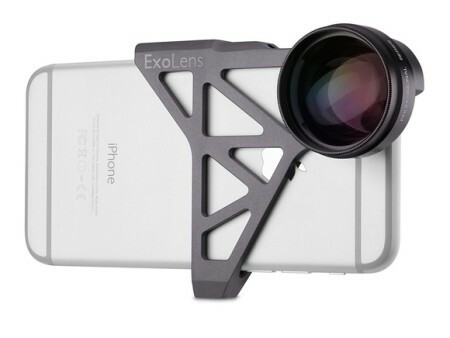 ExoLens is a lens system built for the iPhone 6, intended to give you more shooting flexibility than the standard iPhone lens. The kit comes with an aluminum bracket that slides over your phone, and a pair of lenses that screw into the bracket. The bracket itself is well-made, and the inside is lined with a rubber material to keep from scratching the finish on your phone. Tolerances are tight, however, and ExoLens will only work on your naked, un-cased iPhone. Slide the bracket onto your phone, and the lens mount aligns perfectly with your iPhone camera. All the buttons are accessible, and the bracket features a standard 1/4-20 tripod mount. Unfortunately, the mounting bracket covers the iPhone’s flash, but does anyone really use that anyway?